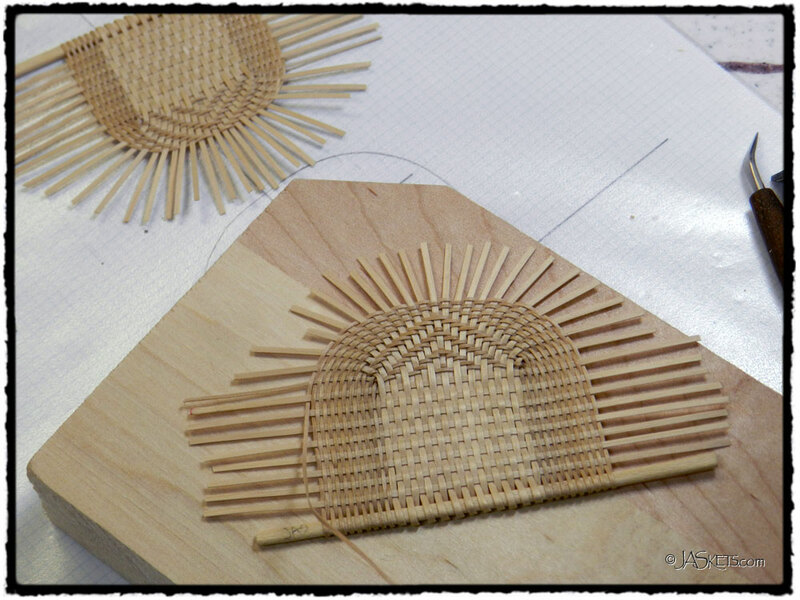 Just about have my knotted basket completed. I got to the top of my styrofoam form, dug it out and knotted up a few more rows. 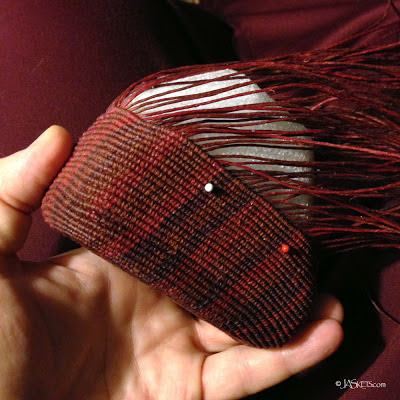 I finished off the edge with a row using a thicker core. 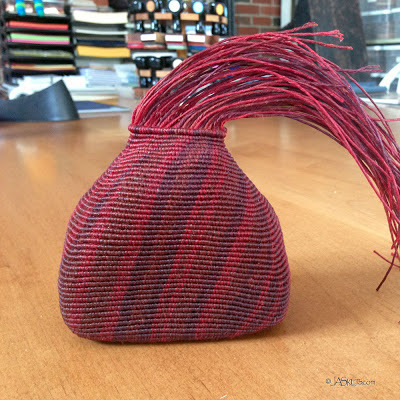 Now I just need to figure out what I want to do with all the tails of my knotting threads. I have some ideas, but need to do some experimenting before I start cutting anything. 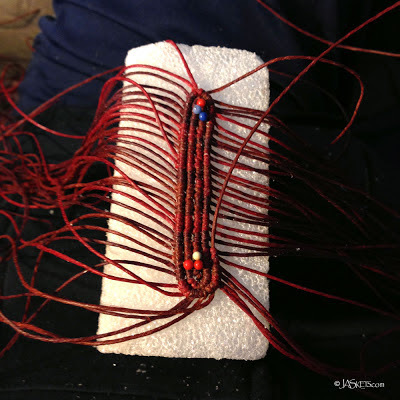 My friend Joanne asked me to help her with a knotted project he was playing with. 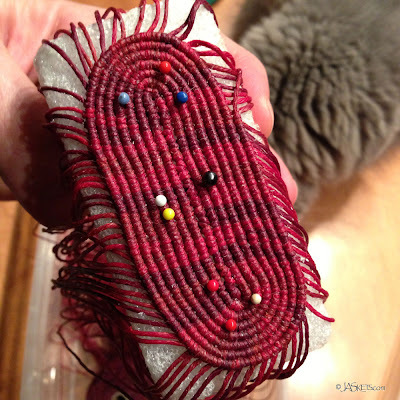 I hadn't knotted in ages, so had fun helping her figure out a few different knots that I hadn't even done. 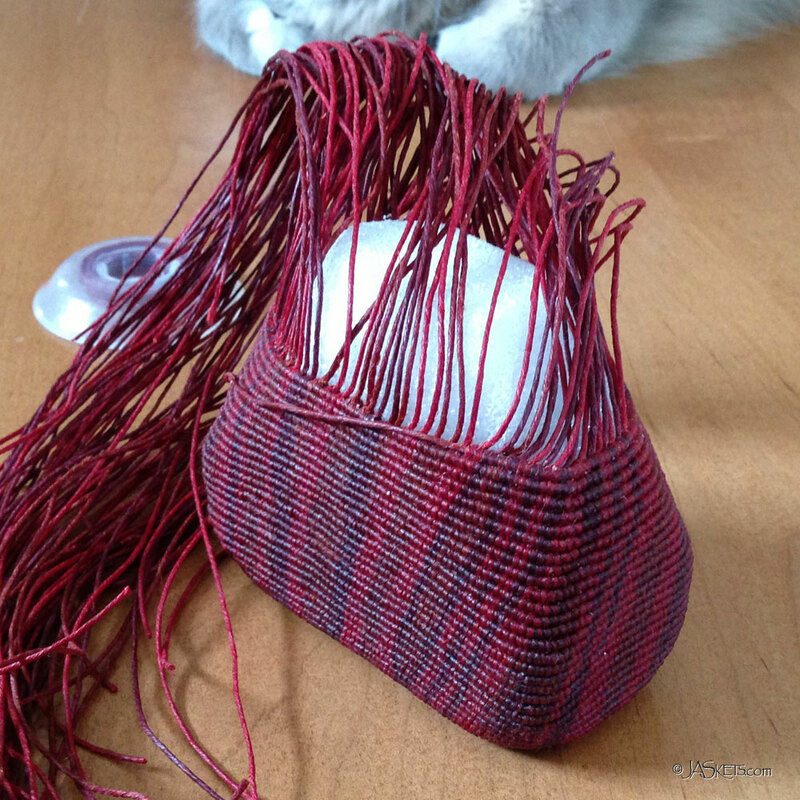 I wasn't sure if I was going to give it back to her as I was demonstrating. So, when I got home I started up my own knotted basket. 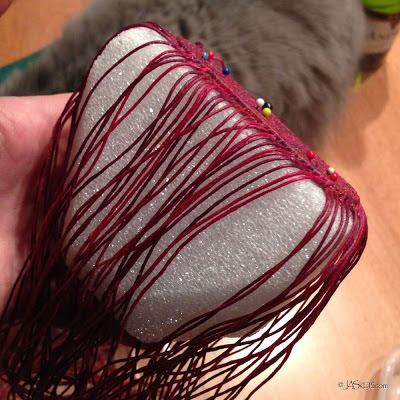 Here are some photos of the project in process. I am using 7 ply Irish waxed linen in three shades of red. The "beads" are glass headed pins that I use to hold the piece to the styrofoam block that I carved into form. I may or may not dig the styrofoam out of the basket (in all of my other baskets I have). 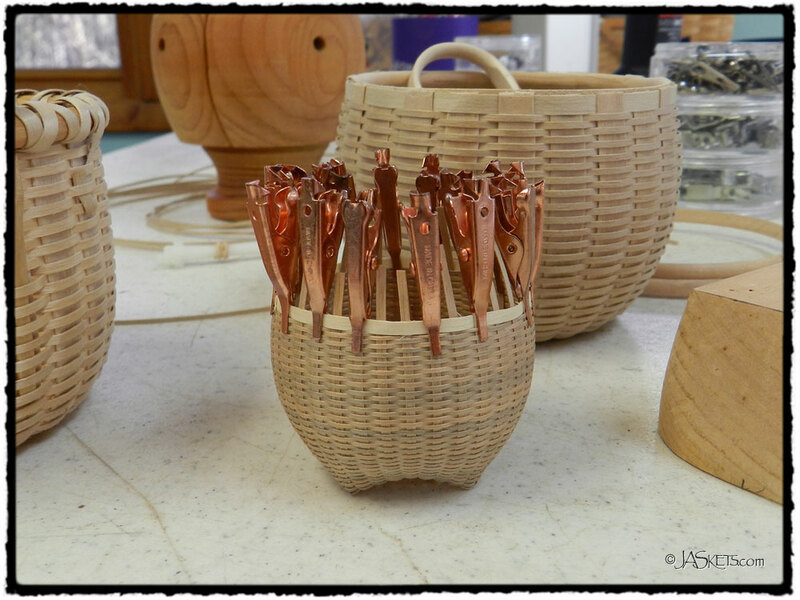 UPDATE: Be sure to check out my followup post with more photos of the basket in process, along with the finished piece, here. 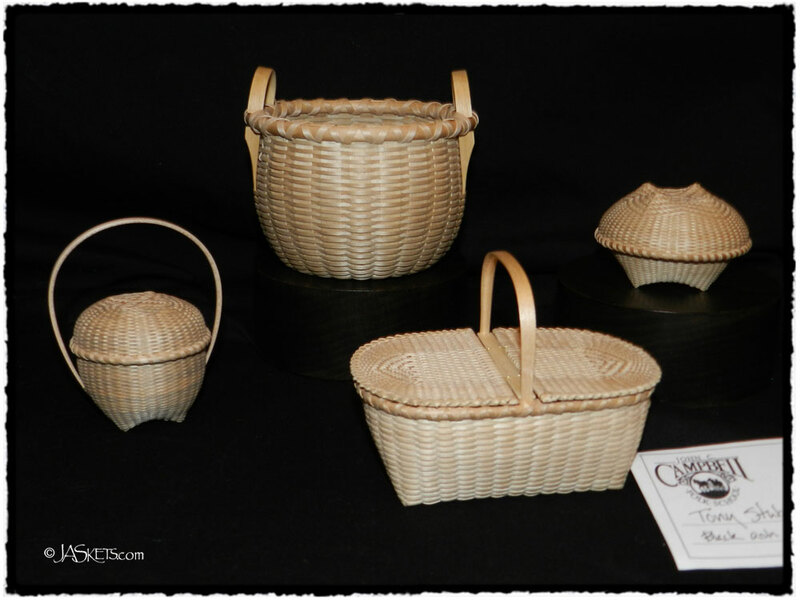 At the 2012 Missouri Basketweavers Guild convention I was fortunate to win a week's tuition to the John C. Campbell Folk School in Brasstown, N. Carolina. 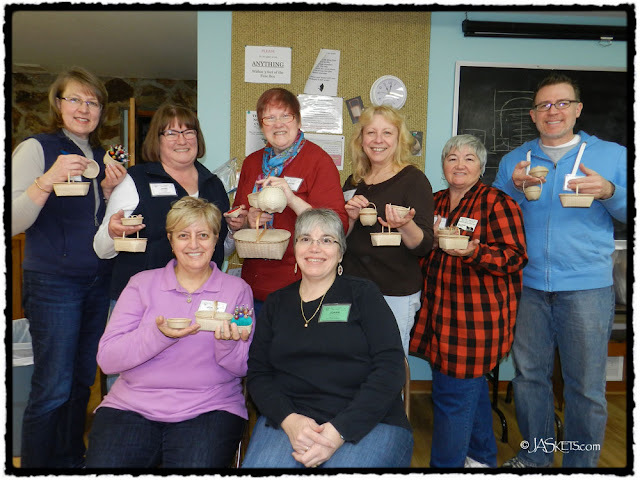 I choose to take a challenging class with JoAnn Kelly Catsos making miniature black ash baskets. For whatever reason I don't typically make minis on my own, so was excited to do something outside my comfort zone. Leading up to my week at the Folk School the forecast was calling for temperatures in the 50s, but by the time the date actually arrived there was chances of snow and ice. 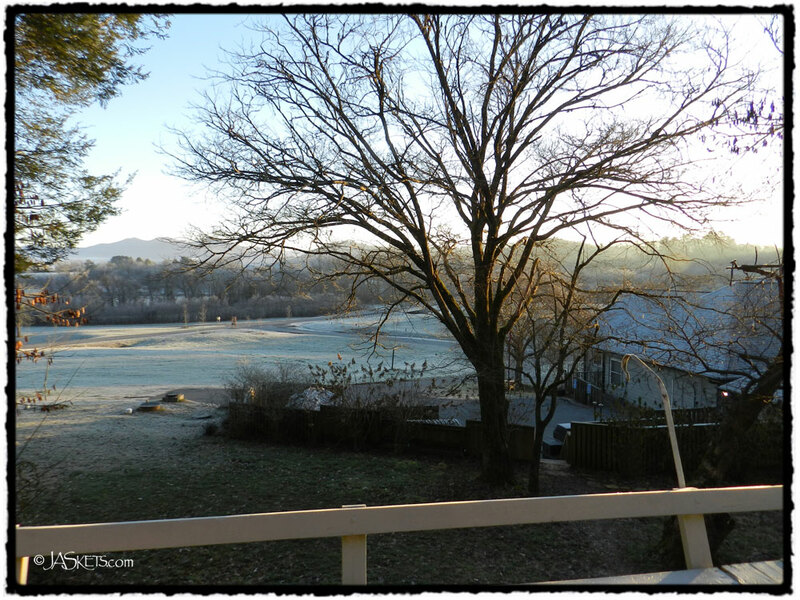 Even so a frosty morning at the Folk School is better than any typical morning at home. 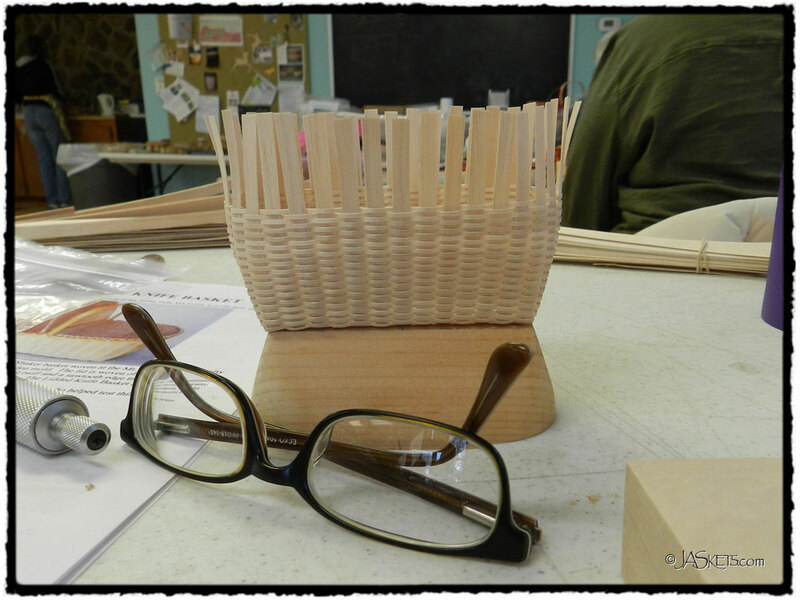 On Monday we jumped right into things and started working on a 4" lidded Shaker knife basket. 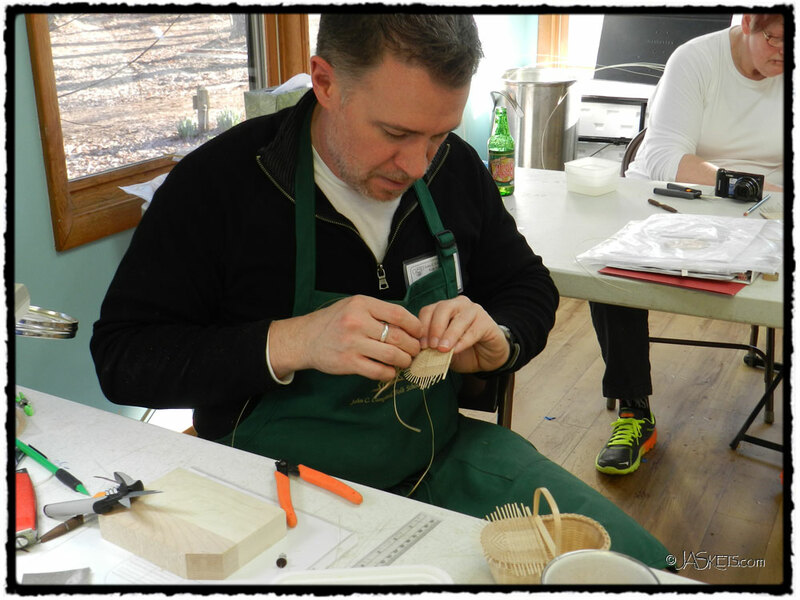 Weaving the body of the basket was deceptively easy. We had no idea what we were in for with the lids. 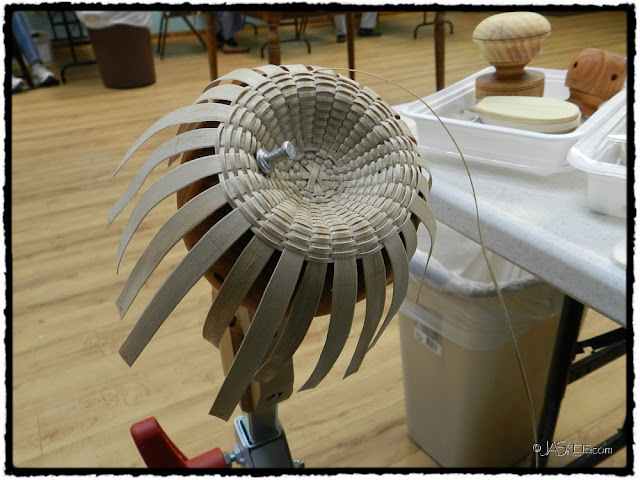 By the end of the day we have the body of the basket completed and JoAnn had passed out the weavers for the lids (that is the little bundle of splint resting on the mold). The lids would have to wait for morning when we were well rested and the light was good. Not being one to waste any of my time at the Folk School I start working on another basket. I had made a 10" diameter Bushwhacker style basket a few years earlier, so thought a 4" mini/small version would be perfect for this class. Working on this basket seemed like weaving a bushel basket after the mini knife. Tuesday morning arrived and we dove into the lids. The uprights for the lids were the weavers on the body of the basket. While this doesn't look like much work it took us until lunch to get to this point. 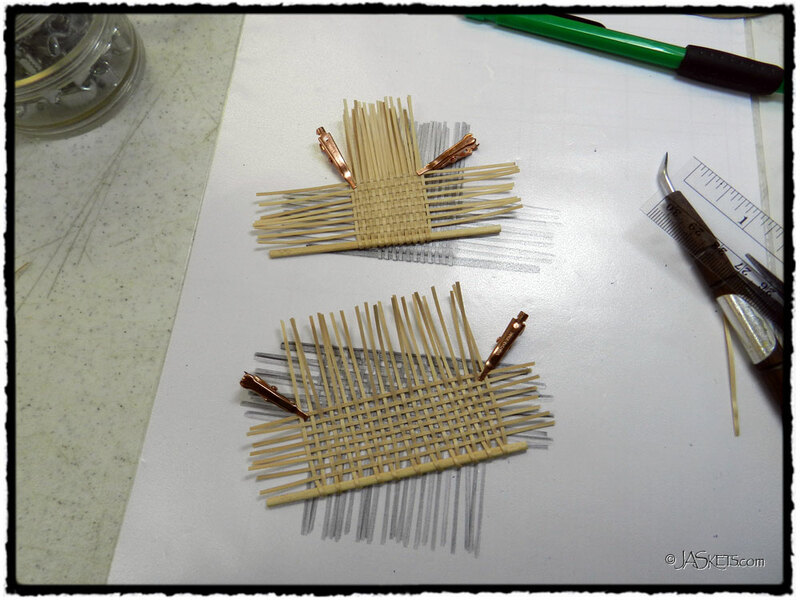 The rest of the day was spent weaving just one weaver into each lid. Wednesday morning arrived and we jumped right back into working on our lids. 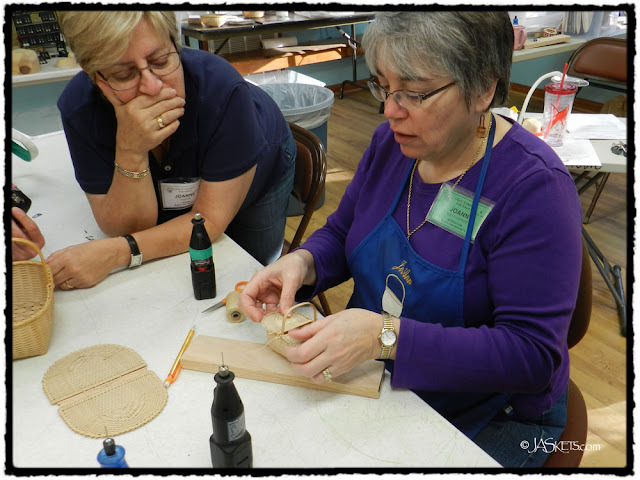 JoAnn had emphasized patience in preparing us for this class and the advise was no joke. Fortunately we all stayed in out "happy place" and took our time. 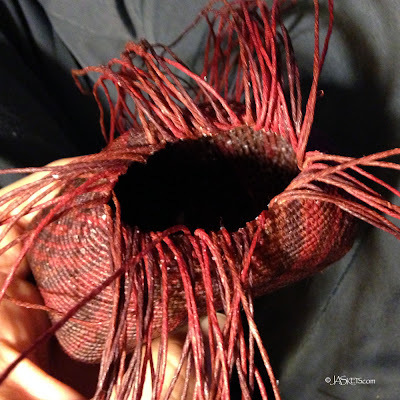 The materials were so delicate that it would have been easy to over power them. 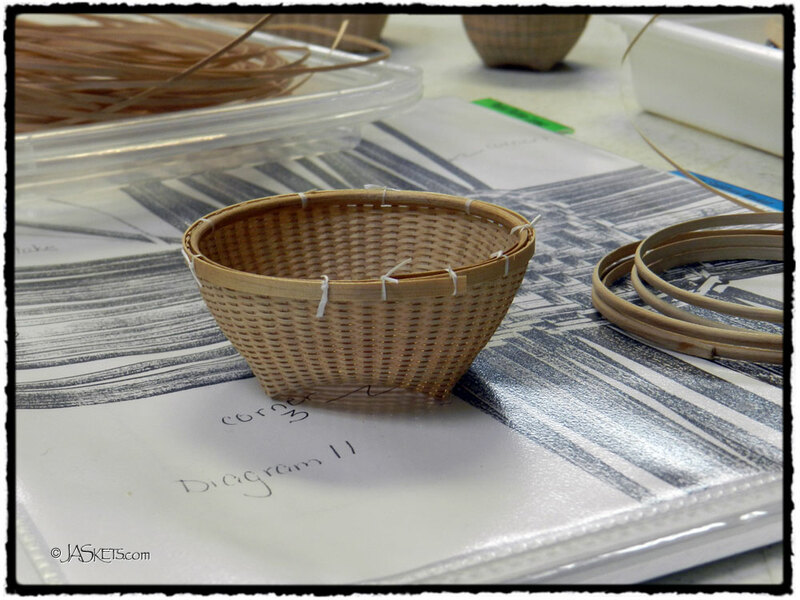 Three days of weaving and we have the lids about fit to our baskets. 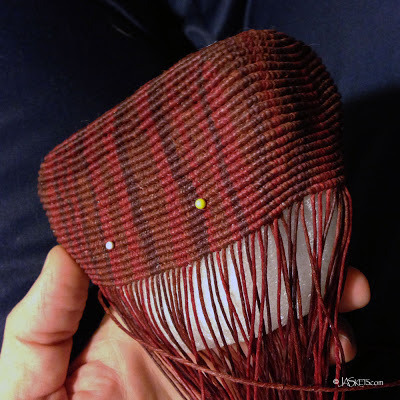 The edges of the lids had a saw-tooth rim treatment. As little as these lids were and as long as it took to weave them the rims were surprisingly easy or maybe they only seemed easy in comparison to the last few days of work. As a break from the lids I worked on a 1 1/2" diameter cathead basket with dome lid. 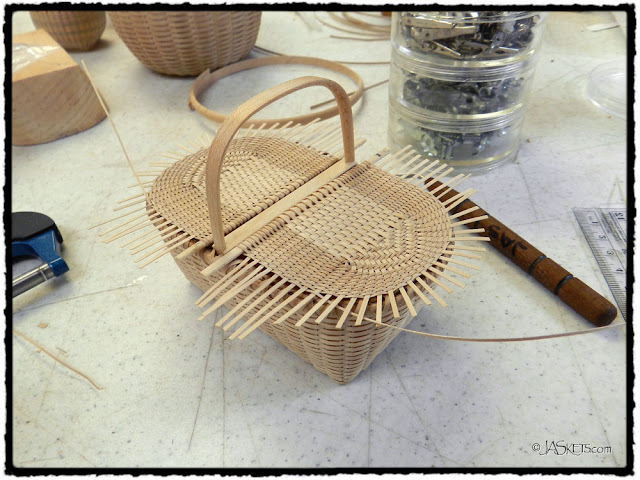 The uprights on this basket are 1/16" and the weavers are 1/32"! 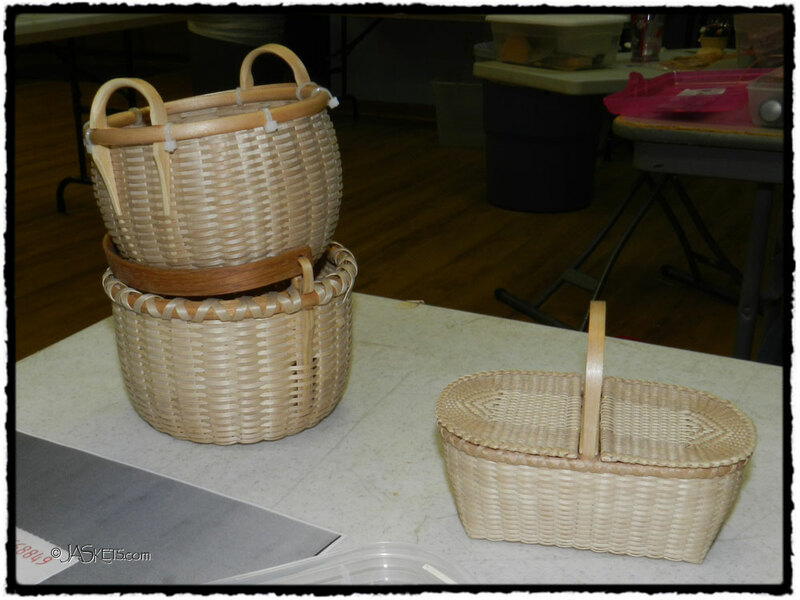 Thursday was time to attach the lids to the basket. Nothing like drilling holes in the lids you just took two days to weave. JoAnn demonstrated and then sent us off to complete our baskets. 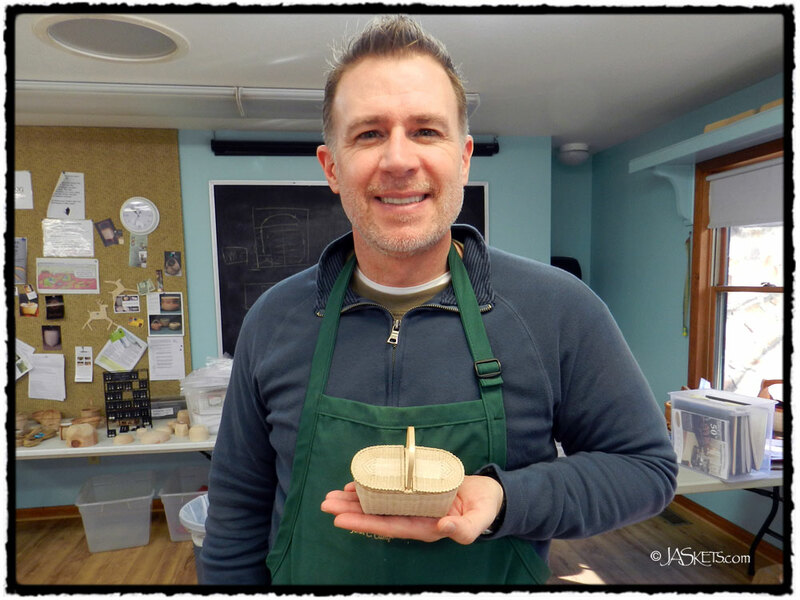 The 4" Shaker lidded knife basket is complete. 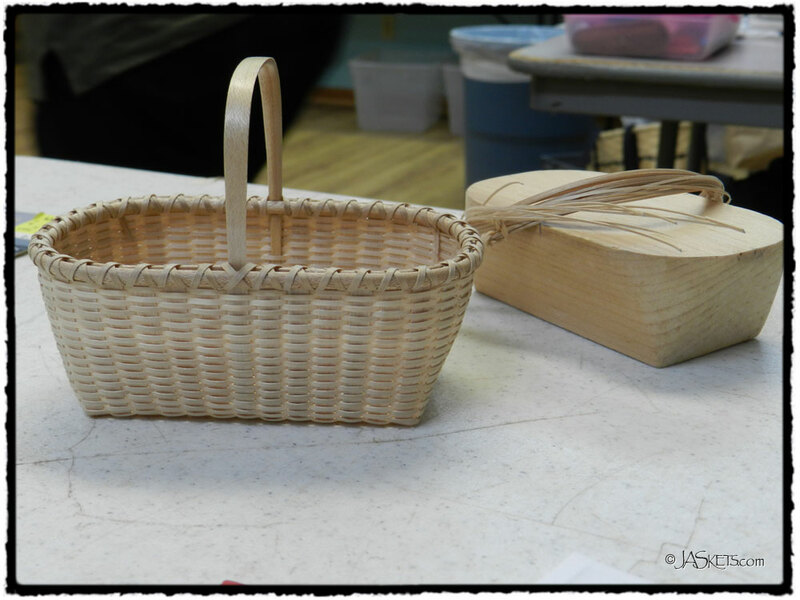 This was a basket I never dreamed I would make. My Bushwhaker basket was originally going to have a a swing handle like the sample I brought, but the handle I had made prior to class didn't fit as well as I wanted. So, I mad a quick switch and made a pair of ear handles out of some white ash growth ring I had in my stash. 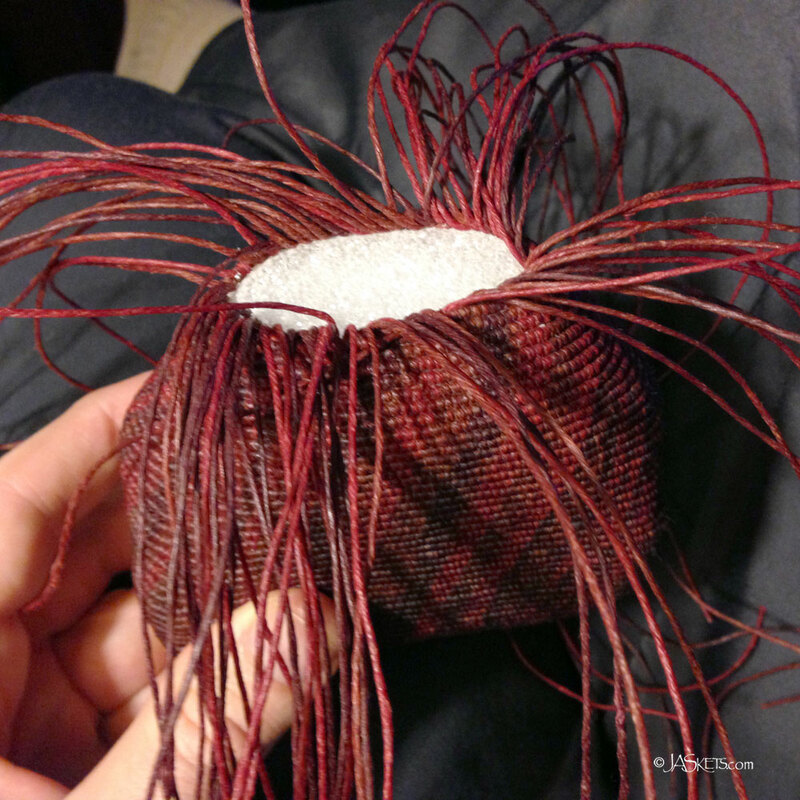 A fourth and final basket I planed on making during the week was a miniature version of a lidded sewing basket, the first basket that I ever made with JoAnn Kelly Catsos. This 2 1/2" diameter basket was so tiny that I had to use dental floss to tie the rims on. 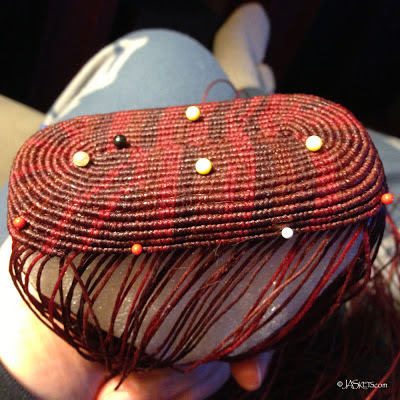 To complete my lidded sewing basket it needed a lid, so on the last night I wove until almost 1 a.m.
Friday morning arrived all too quickly, but even so everyone was so pleased with everything they had accomplished. I am only holding three of my four baskets. I am not sure where my Bushwhacker was. 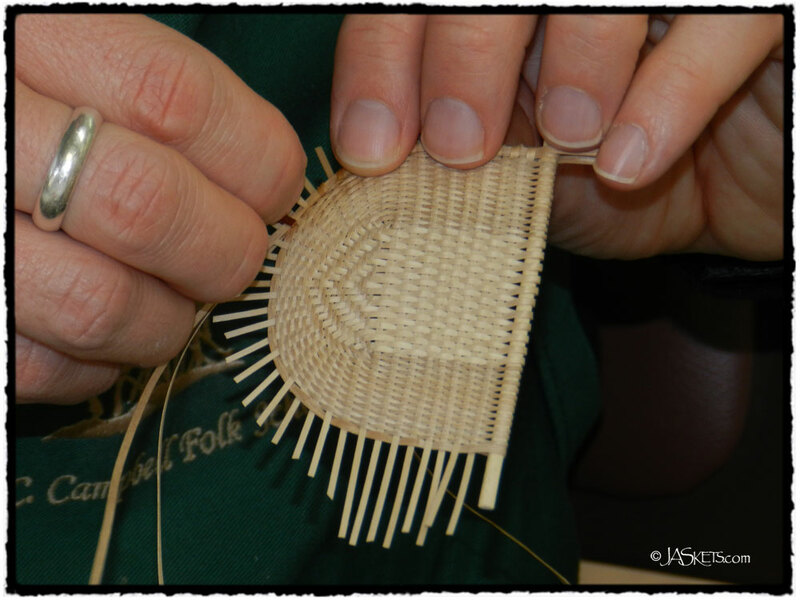 If you haven't been to the John C. Campbell Folk School, on the last day they have a show-and-tell where everyone in all the classes display their work for the week. 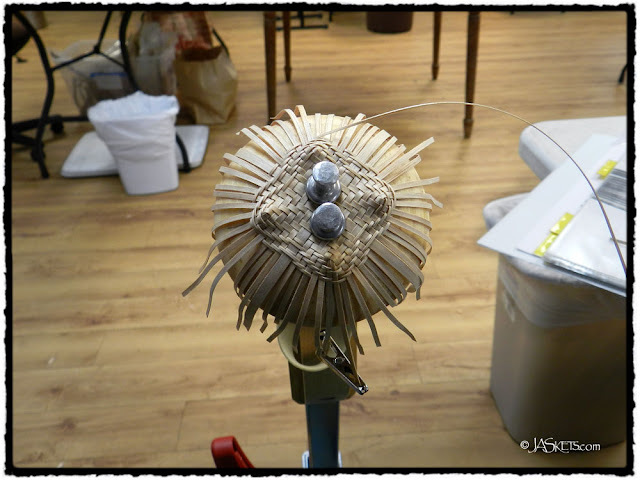 It is so much fun to see what everyone was working on. 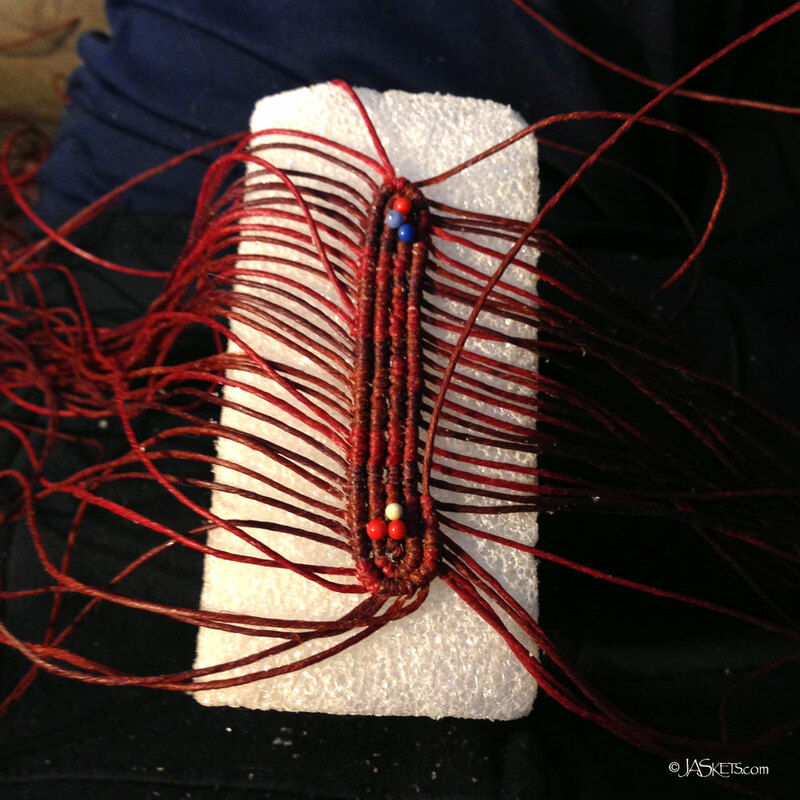 Here are the results of my many many hours of work and many many hours of fun.